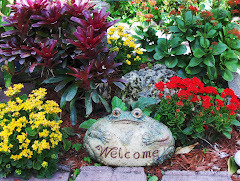 Welcome to my blog--a journal about my urban garden and the critters that live and visit it. I am taking a few days off from the garden, as much as I love been outdoors playing in the dirt, sometimes a little time off is called for. My zone 10b garden requires a constant oversight of plants and weeds and that constant oversight can be a little exhausting. I am taking the rest of February off, this is the best month weather-wise in South Florida, a perfect time to explore what my town has to offer. The Oxalis weeds are a little difficult to control, so I decided to let them be. The starburst trees are full of flowers all over my neighborhood. I like these flowers but the tree can be a bit of a nuisance. Mango season is not looking very good this year, must of the trees are not showing many flowers. This time last year my trees already had small fruits and were full of flowers. It is difficult to kill a bougainvillea plant. This is my oldest bougainvillea, it has been in a container for over ten years. Last month, while all my other plants were blooming this one looked like it was dying. After much TLC, look at her now. This is one of many Sticks on Fire plants around the garden. This succulent is so easy to grow and is not bothered by our extreme weather conditions. If you look closely you can see our local hummingbird looking for food. Last week I filled two trash cans of old bromeliads, it was time for my least favorite job in the garden. Taking out the old bromeliads and making room for the new pops for next summer flowering season. This is what this area looked like last summer. I am a late-comer to the pleasures of gardening but I come from a long line of farmers and gardeners. I was born on the island of Cuba and my family always worked the soil, cultivating plants for food and beauty. Today I live in the fast and hectic city of Miami. My back yard is small, but I am slowly trying to make it into an oasis and a refuge from the hardships of urban living.